Recently, Locus Map map portfolio has been growing like mushrooms after rain. Let’s sum it up – in the USA, we added splendid trail maps by NeoTreks and satellite maps by USGS. Germany, Austria, northern Italy etc. – traditional maps of Kompass that we wrote about last time. Israel is newly covered by detailed maps from Israelhiking that can be downloaded to offline for free. And in near future the map increase won’t cease – great hiking maps of the British cartography publisher Ordnance Survey Landranger and Explorer are coming shortly, we negotiate offline maps of IGN in Belgium and France. The latest version of Locus Map brought also maps of Polish cartography publisher Compass – the only Polish map producer that we exclusively cooperate with. Let’s introduce them a bit. Similarly to the Czech provider SHOCart, whose maps we also have in our portfolio, Compass originated from the base of producing maps for orienteering sports – running and MTBO. Some time 15 years ago a group of enthusiasts started to solve the lack of quality orienteering maps by drawing them on their own. Detailed maps in big scales became their daily routine. Then there was also passion for mountain hiking so production of hiking maps was soon another logical step forward. After a few first humble attempts and acquiring more and more experience the mappers decided to produce maps commercially. The special orienteering maps were accompanied by hiking maps in 1:50 000 scale, forming today a major part of Compass production..
How do the maps look today? From their orienteering beginnings the contemporary Compass maps brought one of the production methods – precise mapping work in terrain. So, with Compass maps be assured that what you see on the map is also in real world. Furthemore, all approved in cooperation with local landscape treasure managers – National and Natural parks. Of course, all is rendered by latest digital technology. Above the detailed topographic background, a rich layer of tourist information is placed – marked hiking routes and cycling trails, architectural sites, natural landmarks, accomodation and catering facilitie. 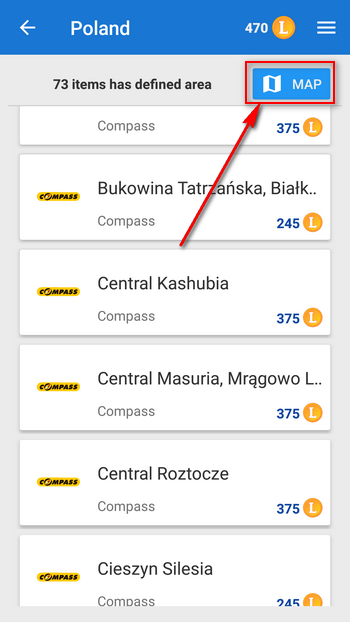 Compass offers the most demanded maps in Poland. Which Compass maps are available in Locus? Locus offers 74 titles of hiking maps of Compass. It’s almost complete portfolio of the publishing house. Only maps of areas covered by other our partners were excluded, e.g. Nizke Tatry that are covered by SHOCart. 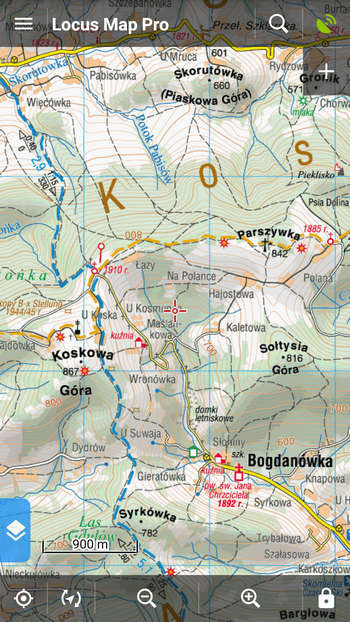 The core of Compass production is made by maps of Polish Beskid, Bieszsczady, Pogórze, Polish part of Vysoke Tatry mountains and foothils. The offer contains also maps of central Poland, Sudety, Kaszuby and Mazury. Besides the Polish areas Compass offers also two maps of mountains in Ruthenian Zakarpathia. Maps are available in Locus Store in packages that can be displayed in offline mode without need to be connected to the Internet. You can select them from a list or on a overview map. The overview map can be switched on from the top right corner. Just move map on the cursor position and tap. Russian Zakarpathia???? This is in Ukraine, not Russia! Sorry, we do apologize – mistake in translation from Czech “Zakarpatská Rus” which means Zakarpathian Ruthenia. The mistake has been fixed. It’s always nice to have the option of choice. So these raster maps (both on-line and downloadable/off-line) are very welcome. I’m rather curious what advantages they have (if any) compared to Locus LoMap vector maps. Do these raster maps have any advantage over LoMaps? Do they display things (shelters, huts, small pathways) that LoMaps don’t? Do they indicate the length of time that it takes to go along the trails? Vice versa; do LoMaps offer anything that these superb raster maps don’t? Display times: can you tell me an approximate percentage difference for the time it takes to render and display the tiles on the screen of the Android device? I.e. when you pan the map, which maps are displayed quicker and smoother and by how much? E.g. on a higher-mid range phone and on a very high-end phone. Advantage of Compass maps over LoMaps – they’re more detailed (more shelters, huts, pathways), they’re rendered by professionals. Some of them indicate the trail times (esp. in the mountains). They are quicker to display (perceptibly but we don’t have precise % differences). Advantage of LoMaps over Compass maps – they are sometimes more accurate, contain more zooms, the rendering is clearer and smoother, LoMaps take less phone memory.